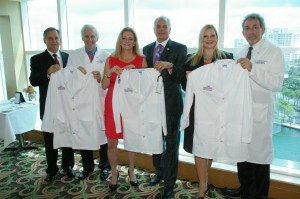 BOCA RATON, FL (July 11, 2012) — Bonnie and Jon Kaye and their firm Kaye Communications, Inc. are sponsoring the second annual “White Coats-4-Care” awareness and fund raising reception to benefit the incoming class of Florida Atlantic University’s Charles E. Schmidt College of Medicine on Monday, July 30, 2012 from 5:30-7:30 p.m. at The Bridge Hotel’s Carmen’s Restaurant – Top of the Bridge located at 999 East Camino Real in Boca Raton. To demonstrate the inspiring level of academia found at the first and only medical school in Palm Beach County, the Kayes are pleased announce that this year’s reception guests will have the opportunity to attend a pre-reception private lecture and discussion from 4:00 to 5:15 p.m. given by Dr. Charles H. Hennekens, the No. 81 Science Hero in the history of the world for saving more than a million lives by discovering the link between aspirin and heart attacks. Following his lecture on therapeutic lifestyle changes to improve the quality and quantity of life, Dr. Hennekens, the first Sir Richard Doll Research Professor in FAU’s Charles E Schmidt College of Medicine, will engage the audience in an enlightening question and answer session. Reception admission is a pledge or donation with a minimum per-person gift of $100 to underwrite and dedicate a white coat for a new medical student or a selection from a meaningful roster of contribution opportunities that include a $250 White Coat Ceremony Sponsorship; $500 Medical Student Scholarship Award (based on need); $1,000 Named Seat in the Medical Education Auditorium (with personalized donor recognition or tribute plate that will be placed on the back of each seat), $1,700 for a Total Medical Student Welcome Package, which includes one of each item mentioned above; and $5,000 for a “Named” Medical Student Scholarship Fund. Attendance to the pre-reception lecture by Dr. Hennekens is an additional $20 donation. FAU’s Schmidt College of Medicine officially welcomes the new incoming class of 64 students on August 6th. Later in the week on August 10th, during a special ceremony, each medical student at FAU will receive a white coat, which represents integrity, compassion and trust and symbolizes their shared commitment to serve patients and honor the Hippocratic Oath. The “White Coats-4-Care” reception, to be attended by a supportive cross-section of healthcare, business, community and civic leaders, is the first event scheduled in the Greater Boca Raton Chamber of Commerce’s month-long “2012 Greater Boca Raton Festival Days,” now in its 21styear. The annual series of fun-filled events are held at different locations in Boca Raton during the month of August pairing non-profit Boca Chamber members together with for-profit chamber members with the objective of raising awareness and vital funds for the non-profit member’s philanthropic efforts. Kaye Communications, a South Florida-based strategic integrated marketing and public relations firm, pairing with FAU’s new medical school continues to be natural fit according to Bonnie Kaye, Kaye Communications firm president. Bonnie serves on the board of directors for both the Boca Raton Chamber and FAU Foundation, and firm partner Jon Kaye serves on the advisory board for FAU Schmidt College of Medicine. The concept and the theme of the event — to “dress and equip” the college’s second class for success — was developed to heighten awareness of the new medical school, embrace Florida’s future physicians with a warm community welcome, and raise vital funds to equip these students with the tools they need to begin their medical education and launch their careers. “Along with our event partners, the Bridge Hotel and Cheney Brothers, we are pleased to once again support “White Coats-4-Care” as we continue to celebrate the medical school’s milestones: completion of its first year, welcoming its incoming class of 64 exceptional young men and women, and our firm’s 16th anniversary of serving the needs of our clients, initiating and promoting the benefits of meaningful public-private partnerships, and stewarding ‘collaborative’ efforts to support the on-going betterment of the greater Boca Raton community,” said Bonnie Kaye. The incoming class of FAU’s Schmidt College of Medicine has a cumulative GPA of 3.67 and an average MCAT score of 31. Most of the major colleges in Florida are represented. Other students in the class attended such prestigious undergraduate institutions such as Columbia, Boston University, Duke, George Washington, University of California-Santa Barbara, St. Joseph’s, Brigham Young University, California State University-Los Angeles, UCLA, William & Mary, Ohio State, UNC Chapel Hill, University of Michigan, University of Alabama, University of Wisconsin and Notre Dame. Troy McLellan, president and CEO of the Boca Raton Chamber of Commerce, believes the new medical school continues be important to Boca Raton and that it is a worthy recipient of the Festival Days’ and Kaye Communications’ philanthropic efforts and pleased that Kaye Communications has chosen the medical school as its beneficiary for a second year in support of the Chamber’s 2012 Festival Days. 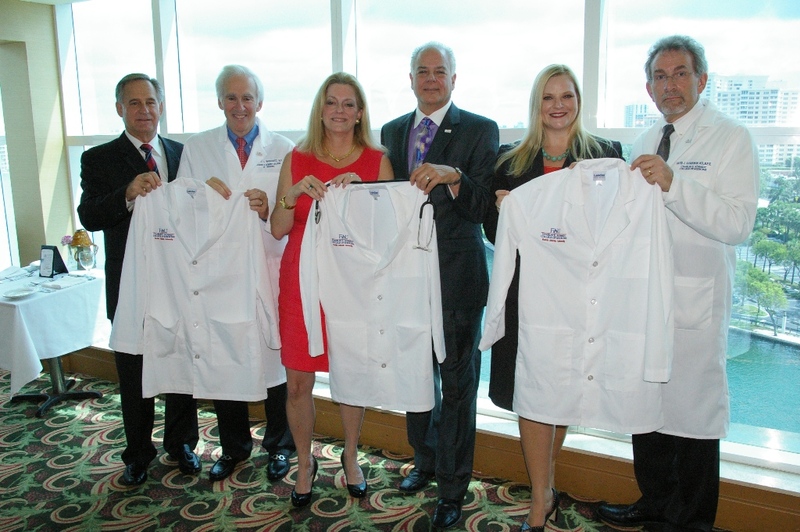 For more information about the “White Coats-4-Care” reception, pledge your gift to attend the event, or to make a contribution, contact Kari Oeltjen, Director of Development, Charles E. Schmidt College of Medicine at FAU at koeltjen@fau.edu or 561-699-7198. From left: Greg Kaylor, General Manager, Bridge Hotel; Stuart Markowitz, M.D., Senior Associate Dean, FAU Charles E. Schmidt College of Medicine; Bonnie S. Kaye, President & Chief Strategist, Kaye Communications, Inc.; Jon A. Kaye, COO & Chief Marketing Strategist, Kaye Communications, Inc.; Kari Oeltjen, Director of Development, FAU Charles E. Schmidt College of Medicine; David J. Bjorkman, M.D., M.S.P.H., Dean & Professor, FAU Charles E. Schmidt College of Medicine.